Summer in St. Louis guarantees three things: Cardinals baseball, heat, and humidity. While we could spend the entire summer cooling off at Ted Drewes with a frozen custard in each hand, that might not be the best thing for our wallets (or our beach bods). So, here’s a list of our favorite local waterparks, splash pads, and spraygrounds that are easy on the budget. Oh, and in case you really were in the mood for ice cream, we included the best place to grab a frosty treat for each location. O’Fallon Family Sports Park offers over 6,000 square feet of public splash activities for families, including arches, buckets and “spider web” and mushroom fountains. Once you’ve had all the water fun you can handle, the park has a super large playground to enjoy. Ice Cream: I Scream U Scream, less than two miles away, is the perfect place to stop off for a treat to top off the day. The St. Louis theme of discovery doesn’t stop at the Arch. Discovery Playground in St. Charles is complete with an adventure themed playground and spraygrounds. Kids can channel their inner explorer as they splash through the man-made creek, adventure through water fountains and jump through water jets. For those not yet ready to explore the seas, there’s plenty of playground equipment to stay entertained. The park also has separate areas for 2-5 year olds and 5-12 year olds. Ice Cream: Grab an Orange Freeze at Little O’s Soda Shop located on Main Street in St. Charles. This newly built spray and play park in Edwardsville offers families throughout the St. Louis region a wide variety of outdoor activities for water and fitness enthusiasts of all ages. This park is appeal to all members of the family with special ADA standards built into the park, a walking/fitness track for health nuts of all ages and must-haves like shade structures, pavilions and restrooms/changing stations. And the best part? It’s free! Ice Cream: Considered a “hidden gem” in Edwardsville, Northside Dairy Haven has been dishing out the cold stuff forever and somehow…it gets better and better each year! They also serve one-of-a-kind food from the grill and have some of the best burgers we’ve ever tasted. Maryland Heights hosts one of St. Louis’ newest spraygrounds at Vago Park. The whole family will love this 20-acre haven with sand volleyball courts, horse shoe pits, accessible bathrooms and a walking/jogging trail. Stay into the evening to grill some hamburgers and have a picnic dinner at one of several sites throughout the park. Ice Cream: Head over to Overland to get a taste of Skeeter’s Frozen Custard. One of the newest (and quickly becoming the most well-known) spraygrounds in St. Louis is Citygarden. Opened in 2009, this park has made a name for itself for good reason; it’s amazing! Located at 8th and Market, this urban playground features over 100 jets in the spray plaza, a wading pool fed by a 6 foot waterfall, and dozens of interesting sculptures and exhibits that encourage a child’s imagination. The splashpad is open from 9am until 10pm during warm months. Why 10pm? Because after dark, the lights turn on and it becomes one of the most beautiful places in the entire city. Ice Cream: It’s just a few blocks walk to Bailey’s Range for the best milkshake you’ll ever have. Shaw Park near downtown Clayton is the perfect urban setting to bring the kids for an afternoon of fun. The hilly, fenced-in park has several pavilions, volleyball courts, a sprayground and two playgrounds, one with a tree house theme. The park is also home to Shaw Park Aquatic Center, which is open to the public for a fee. Ice Cream: Jilly’s Cupcake Bar and Café is a short 5-minute ride up I-170 for a sweet treat to cap off the day. Get out of the house without going far from home by visiting Vlasis Park in Ballwin. The park has a variety of traditional activities, but it also has a neat little sprayground that promises to keep you cool on a hot St. Louis afternoon. The park has enough spray jets for the whole family to get in on the action. Ice Cream: And for the cherry on top, enjoy delicious soft serve from Oberweis just down the road. This park is great for even the youngest kids (and their moms) with cabin fever. Kirkwood Park has a spray fountain, playground, two pavilions and nearly 20 picnic sites. It also has a sand and water play area for smaller children. Even though it’s the most used park in Kirkwood, at 92 acres, there is plenty of room for a fun-filled afternoon. Ice Cream: Try the Uptown Berry Munch from The Custard Station. Yum! Tilles Park is one of the best known parks in St. Louis County. And for good measure as the park is home to the always-busy Winter Wonderland lights display in December. But summer is when the park really comes alive with its huge playground that includes tons of slides, swings, and musical instruments to keep the kids busy. And the highlight (at least for this article) is the splashpad. Open daily from 10am to 6pm, this wide-open space lets the kids run free and splash to their heart’s content. Ice Cream: It’s a short drive to The St. Louis Custard Factory. Sylvan Springs Park is a South County favorite, and with good reason. Water fun is at the push of a button at Sylvan Springs, where one push activates 10 water features including water arches and water bubbles that shoot up from the ground. The fountains run daily from 10am until 8pm. Ice Cream: Just head south on Telegraph Road and you’ll run into Rich’s Frozen Custard. Musick Park is one of the few parks in the area that keeps its splashgrounds open after dark. In fact, the park is almost better after dark because the 30 water streams shine brightly as they’re lit up with a rainbow of colored lights. The 9-acre park is open from 5am until 10pm. Ice Cream: Not too far north from the park is Doozles Frozen Custard. The ultimate day of water adventure awaits at Six Flags St. Louis in Eureka. With attractions like Hurricane Harbor, Big Kahuna, Bonzai Pipeline, Gulley Washer Creek Hurricane Bay and the speed slides, Six Flags offers something for every family member, whether you’re more into racing down slides or floating down the lazy river. And the best part is Hurricane Harbor is included in your Six Flags admission price, so you can get wet & wild at the waterpark and then pack in a full day of coasters too! Use your Family Attractions Card to save money on tickets! Ice Cream: There’s a lot to choose from here, but we’ll stick with the classics: First Cone Parlor. Getting to this legendary waterpark in Grafton, IL is half the fun. Located on the side of a bluff overlooking the Mississippi River means you can take one of two ways to get there: an awe-inspiring drive along the Great River Road from Illinois or the classic Grafton Ferry, which departs from St. Charles on the Missouri side. Among Raging Rivers’ 900,000 square feet of attractions are classics like a wave pool and lazy river, but they also offer Surf City and the Shark Slide for a new spin on old favorites. There’s even a play area exclusively for babies and toddlers. 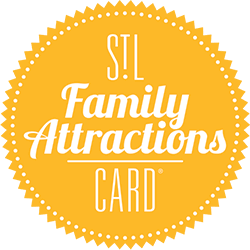 Use your Family Attractions Card to save on your admission. Ice Cream: Dippin’ Dots are available at almost every concession stand. One of the more popular waterparks in the area is the City of Maryland Heights’ Aquaport. With an 8,000 square foot pool featuring bubblers, sprinklers and fountains, a Lazy River, and more waterslides than you can shake a bottle of sunscreen at, this upgraded municipal waterpark has plenty to keep your water babies busy. Ice Cream: Get a hand-dipped shake from the place that makes them like they mean it, Steak n’ Shake. The closest location is on Dorsett & McKelvey Roads. Whatever you do this summer, be sure to make a stop at one of the local ‘watering holes’ for a quick cool down and a fun family experience your kids will want to revisit year after year!